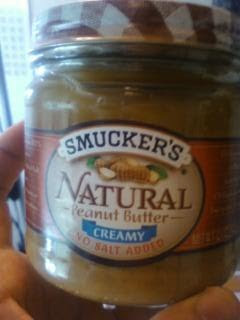 Just Another Day in Japan: Natural Peanut Butter! Kind of funny - the other day I was talking to some new ALTs and advised them that if they're looking for foreign imported food, liquor stores can sometimes be unexpectedly good places to check out. Well, today I swung by the Grande Marche and -- Ta-dah! I found some natural peanut butter (without sugar or salt). Been wanting to get some for a while, but haven't seen any at the normal supermarkets. And it's creamy to boot - just the way I like it! That looks expensive :-/. I think I'm going to pick up some normal Skippy today. I'm so glad peanut butter exists in this country. I have a lack-of-peanut allergy. Wasn't too ridiculous - think it was about 400 yen.